There’s a rare moment of cheer for floundering electric car maker Faraday Future after it landed a new investor and a fresh commitment of capital. Evergrande Health, a division of Hong Kong-listed Evergrande, has taken a 45 percent stake in Faraday Future in a deal worth a total of $2 billion. Evergrande Health has taken over an investment commitment agreed to last November by Season Smart Limited, an investor that swooped in to save Faraday Future when its cash was on the verge of running out. Season Smart invested an initial tranche of $800 million, according to filings, but now Evergrande Health has taken that over for around $860 million, or HK$6.75 billion. Beyond that money, Evergrande Health has a commitment to complete the overall deal by investing $600 million by the end 2019, and a further $600 million by the end of 2020. Aside from Evergrande Health’s 45 percent share, existing investors own a combined 33 percent with the remaining 22 percent allocated to Faraday Future’s 1,000 employees as part of an incentive program. On the subject of staff, founder Yueting Jia (known as JT) will become Faraday Future’s global CEO with immediate effect. It was widely reported that he was keen to keep majority ownership and remain in charge, but it looks like he’s had to settle for the latter only with this deal — but hey that beats being in the deadpool. Faraday Future, which is technically a U.S. firm but is heavily backed by Chinese money, said the deal was approved by the Committee on Foreign Investment in the United States (CFIUS) after the initial agreement from investors in November. 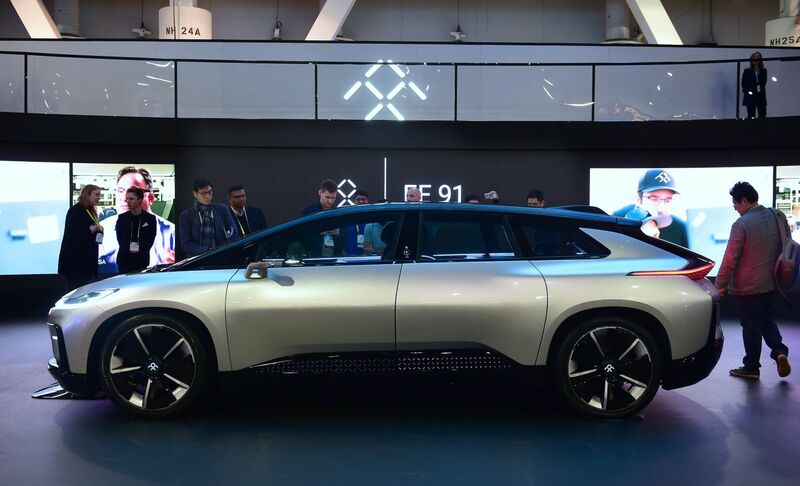 “FF will continue to use the committed funds to accomplish our top priority — finalizing the development and delivering the first production vehicle, FF 91 to both US and China markets,” the company said in a statement. “The investment will also support Faraday Future to expand its product pipeline, develop cutting-edge technologies and grow the business rapidly in the global marketplace, including our manufacturing facilities in Hanford, California and in Guangzhou Nansha, Guangdong Province, China,” it added. The deal is a rare boost for Faraday Future which was founded in 2014 as a rival to Tesla but has struggled to deliver on its hype and promise. The company unveiled its vision for electric cars — the FF 91 — at a glitzy launch event in CES last year, but 2017 was a year to forget. Following on from reports of financial issues with parent company LeEco in late 2016, Faraday Future paused construction of its new factory and then scaled back its product line due to financial concerns. The company was sued by a visual effects team it didn’t pay and then, when the cash crunch really hit home, it canceled plans for an assembly plant in California and went back on a $1 billion project to develop a massive factory in the Nevada desert. After abandoning plans for a tailor-made factory, it later inked a deal on a more general facility in Hanford, California. The drama hasn’t ended for YT, who first founded LeEco, however . He’s been under pressure in his native China over debts that have piled up — to the sum of $890 million — for his Leshi Internet video streaming division. Tencent and JD.com, two large Chinese internet firms, invested in LeEco’s smart TV unit earlier this year, while the parent firm was previously bailed out by property company Sunac in early 2017.